Historically, Brydge has released keyboards for iPads and Surface Pros, although we became more familiar with the company thanks to the 'Made for Google' Pixel Slate keyboard it recently produced. Brydge's Google intentions don't stop there, though, as it's now announced the first-ever wireless keyboard and touchpad designed exclusively for Chrome OS. I did some digging around and it appears that the wifi driver shipped with both webOS and with the Android are GPL, there are multiple evidences of that including the driver licensing string. 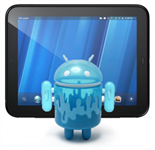 The earlier CM7 Alpha 1 and Alpha 2 builds were quite buggy and not really ready for primetime use, but the latest CM9 release is a whole "*two* CyanogenMods better", bringing Ice Cream Sandwich goodness to the Touchpad. However, CM9 is still Alpha 0, which means "'zero hardware-accelerated video', 'zero camera', and 'zero support!'". In addition, the audio "is a mess", the microphone does not work, market filters prevent some apps from being installed, Titanium Backup crashes the kernel, some older hardware problems from CM7 still exist, and traditional storage mounting is not supported. 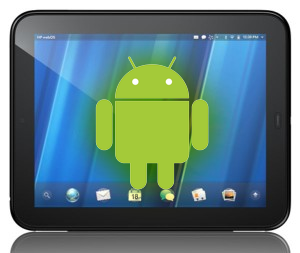 If you happen to own an HP TouchPad and have been waiting patiently for a proper Android port, you'll be overjoyed to see a sneak peek of what CM9 brings to the table. If you recall our announcements for the CM7 Alpha 1 and Alpha 2 builds, you probably remember an overwhelming indication that neither build was all too stable, and running them was not for the faint of heart. Alpha 3 is a bit better, but still has a laundry list of issues. A lot of things don't work, or only work intermittently, which makes it very difficult to use for the average consumer. Soon after HP started their TouchPad fire sale, a version of the device running Android 2.2 appeared on eBay and went on to sell for almost $700. 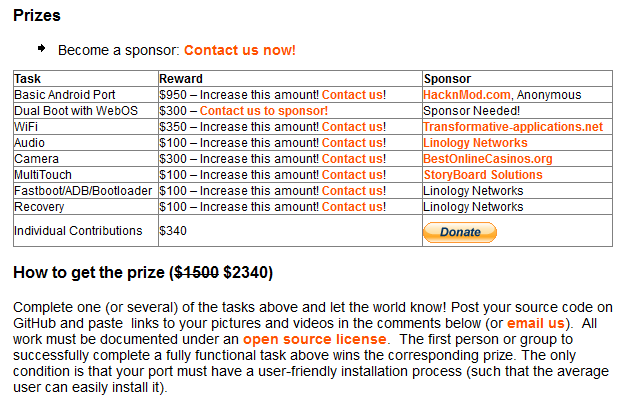 Hopes for an Android port were high and the developer community swung into action offering a $2300 bounty for anyone who could load Android on the TouchPad. The CyanogenMod team, Android developers extraordinaire, did not disappoint and soon the news broke that they had managed to successfully get Android running on the TouchPad. 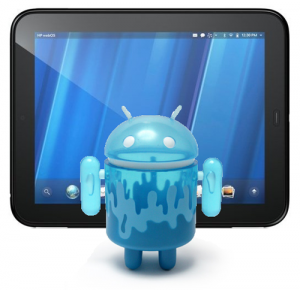 Over the next few weeks the CM team made a number of tweaks to the various hardware and software components of the HP TouchPad, including GPU acceleration, Wi-Fi, Sound, Accelerometer, 3D Games, and video acceleration to ensure that CM7 worked smoothly. 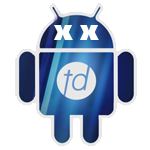 In the beginning, there were two primary teams working on developing a touchpad-friendly version of Android: Touchdroid and CyanogenMod. When the first video of CM7 successfully booting on the Touchpad surfaced, it was big news, despite the fact that next to nothing worked (not even the touch screen).